Are YOU Tough Enough to Conquer the Bluff? This challenging Half Iron course begins with a 1.2 mile swim in the clear waters of Horseshoe Bay. The 56.3 mile bike route travels along Door County’s scenic backroads, through the main retail district in Sturgeon Bay, along the shipping channel, out and back on a wooded back road and gradually ascends 200 feet up the famed Door County Bluff before returning to Murphy Park. 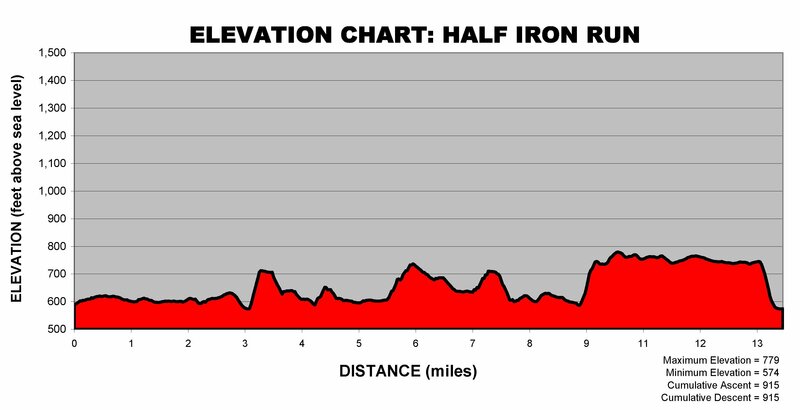 The 13.1 mile run course takes participants north to the Egg Harbor Dock, up Harbor Heights Road, through the village of Egg Harbor, up the infamous Bluff Pass Road (200 foot climb in 1/2 mile), and through the stacked stone fences of Horseshoe Bay Golf Course before a downhill descent to the finish line. Run Course Closure: The run course rest stations will close at a pace of 16 minutes per mile beginning at 2 pm. So, for instance, the first run course rest station at mile 1 will close at 2:16 pm. The event’s Follow Vehicle will notify any slow moving participants if they are in danger of not meeting this schedule so they are aware that the fluid stations ahead of them will be closed. These participants will be offered free transportation back to Murphy Park, or, if they choose to continue, they will be offered a water bottle to carry but from that point on they must be self-supported. Note: These cut-off’s are subject to change on race day based on any delays or changes in the course distances related to weather incidents. Relay teams ARE allowed to have a team member as the swimmer who is simultaneously competing as an individual. These teams are cautioned on two issues. First, it is CRITICAL that this team member, who will be wearing more than one timing chip, NOT confuse their individual timing chip with the relay timing chip. Doing so may jeopardize the results, the overall standings and may result in disqualification. Second, this individual must go off in their age/gender wave rather than the relay team wave to avoid gaining an advantage in their age/gender bracket. This certainly creates a disadvantage for the team but that is the price of having chosen someone as your swimmer who is simultaneously competing as an individual. Avoiding an advantage for one competitor in the age/gender brackets trumps avoiding a relay team put at a disadvantage. *Note: If a relay team is anchored by a swimmer who is also competing as an individual, that team must begin in the wave of the individuals age/gender bracket or the individual will be disqualified. The Half Iron swim waves will begin at 8:00 am. Wave assignments, sizes and anticipated start times will be posted to the event website in early July. ROUND ORANGE guide buoys mark the route and should always be on the swimmers left side. They are located every 50 yards (150 feet) and are numbered 1 through 40. Although the average water temperature in Horseshoe Bay in late July exceeds 70 degrees Fahrenheit, Half Iron participants MUST HAVE a wetsuit available in case of cold water temperatures. If water temperatures are below 65 degrees, wetsuits will be REQUIRED of Half Iron participants. In such a scenario, Half Iron participants without wetsuits will not be allowed to compete. If the water temperature exceeds 65 degrees, participants will not be required to wear wetsuits. If the water temperature exceeds 78 degrees, participants will not be allowed to wear wetsuits in accordance with USA Triathlon rules. Finally, if conditions are dangerous (water temperature below 60 degrees and/or very heavy chop), race organizers reserve the right to abbreviate or cancel the swim portion of the triathlon. In no case will there be refunds or rebates. The bike course follows the shoreline along Bay Shore Drive, passing through the shopping district along Third Avenue in downtown Sturgeon Bay before making an out-and-back loop into the flat agricultural roads in Sevastopol on the eastern side of the peninsula. After looping back through Sturgeon Bay, the bike route climbs through the hills and cherry orchards north of Sturgeon Bay before dropping back onto Bay Shore Drive and returning to Murphy Park. Bar ends covering the opening on the end of the bike’s handlebars are required. Crossing the centerline of the road is prohibited and grounds for automatic disqualification. BIKE COURSE FLUIDS: Fluids will be available at the start and on the course at mile markers 5, 15, 28, 40, and 50. On average, that translates to a bottle exchange every 11 miles! Sports-capped 20-ounce water bottles will be handed out at each bottle exchange. These bottles will ride comfortably in bike cages. Gatorade Endurance Formula sport bottles will be available at all of the bottle exchanges. The Gatorade bottles WILL ride comfortably in bike cages. Participants are welcome to supply their own bike bottle and fluids if they so choose. HAMMER GEL: Hammer Gel will be available on the course at mile markers 15 and 40. Flavors include raspberry, espresso, huckleberry, apple-cinnamon, vanilla, and peanut butter-chocolate. RUN COURSE FLUIDS: Water and Gatorade Endurance Formula will be available in the transition are and at the finish line. 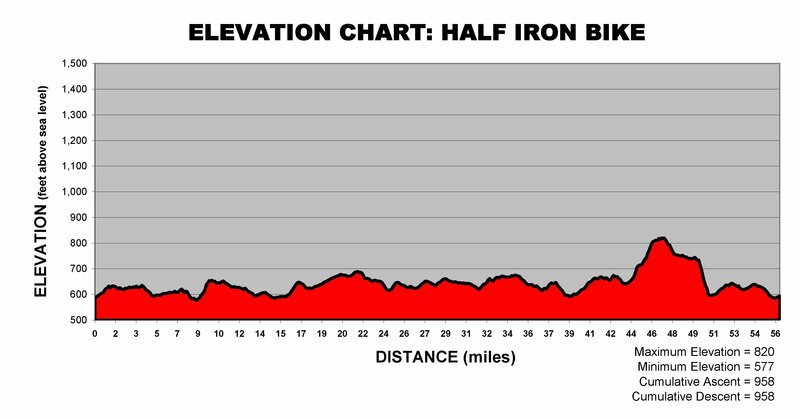 In addition, there will be NINE on course fluid stations offering water and Gatorade Endurance Formula at mile markers 0 (Start), 1.5, 3.1, 4.2, 5.5, 7.1, 8.0, 9.7, 10.8, and 12.3. On average, this translates to a water station every 1.3 miles. HAMMER GEL: Hammer Gel will be available on the course at mile markers 3.1 and 8.0. Flavors include raspberry, espresso, huckleberry, apple-cinnamon, vanilla, and peanut butter-chocolate. In keeping with the overall 8.5 hour time limit (5:30 pm barring delays) and the 2 pm bike-to-run cutoff, the run course rest stations will close at a pace of 16 minutes per mile beginning at 2 pm. The event’s Follow Vehicle will notify any slow moving participants if they are in danger of not meeting this schedule so they are aware that the fluid stations ahead of them will be closed. These participants will be offered free transportation back to Murphy Park, or, if they choose to continue, they will be offered a water bottle to carry but from that point on they must be self-supported. Participants should be aware that many portions of the bike and run courses are open to motor vehicle traffic. Even the “closed” sections of the course have residential housing and it is possible that a car could emerge from a driveway despite our best efforts to notify the public about the event. PARTICIPANTS MUST BE ALERT TO THE POSSIBLE PRESENCE OF MOTOR VEHICLES ON THE COURSE. Course marshals and public safety officers are stationed throughout the course and at all turns to help prevent collisions. The finish area is located in the south end of Murphy Park on the beach, the parking lot and the pavilion. Observation bleachers will be available to spectators along the finish line chute. The post-race party includes free water, Gatorade Endurance Formula, beer, soda, bagels, fruit, and a pig & corn roast. Each participant will have bib tags for a pulled pork sandwich, a roast cob of corn and two beers. A DJ will be playing music and announcing names all day long at the finish line.